Seeing the nut of Quercus insignis in person for the first time was a peculiar experience. I didn't know acorns came that big! What was even stranger was encountering this species in the tropics. I thought that in leaving my temperate home behind, I had left trees such as oaks behind as well. 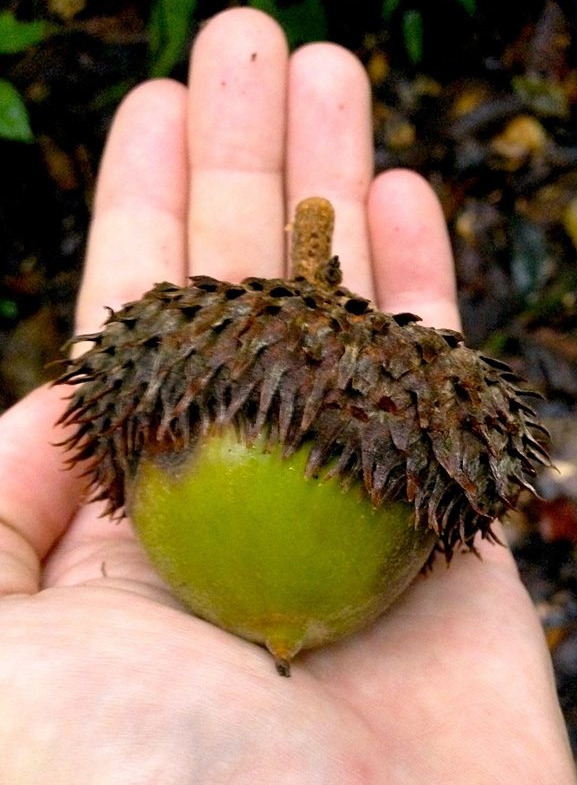 Thus, picking up this gigantic acorn was a challenge to my ignorance of tropical forest diversity. What it did for me was ignite a fury of questions regarding the biogeography of the genus Quercus. Quercus insignis is native from Mexico to Panama. It is a member of the white oak grouping and, despite having one of the largest acorns of any oak species, relatively little is known about this species. What we do know is that it is in trouble. It is considered critically endangered in Mexico and near threatened in Guatemala and Panama with a remaining stronghold in Nicaragua. Habitat loss and changing environmental conditions seem to be at the core of its disappearance. One big question was looming over me. What was an oak doing this far south? Call it a northern bias but I have always associated oaks with more temperate climes. I needed to get over this. My investigation lead me to some very interesting work done on the family to which oaks belong - Fagaceae. Based on some incredible paleontological and genetic detective work, we now know that Fagaceae originated in Asia. The first fossil evidence of a member of this family dates back some 100 million years, during the early part of the Cretaceous. At this time, the continents of Asia, Europe, and North America were still connected. Some 60 million years ago, the genus Quercus diverged from Castanea. They were also starting to radiate across the Northern Hemisphere. The first fossil evidence of oaks in North America comes from Paleogene deposits dated to 55 to 50 million years before present. This is when the oaks really started to hit their stride. Between 22 and 3 million years ago the genus Quercus underwent numerous speciation events. The new terrain of North America must have presented countless opportunities for oaks because they quickly became the most specious genus of all the Fagaceae. This radiation was particularly fruitful in what would become the U.S. and Mexico. Of the roughly 220 species that exist in this region today, 160 occur in Mexico, and of those, 90 species are endemic. This brings us to the tropics. Evergreen and semi-evergreen oaks have done quite well in this region. However, their astounding diversity quickly drops once you hit the isthmus of Panama. South America is home to only one species of oak. What happened that limited the oaks reign south of the equator? To put it simply, geology happened. For much of the Earth's history, North and South America shared no connection. Though the exact time frame is debated, tectonic forces joined the two continents some 4.5 million years ago. The Great American Interchange had begun. The two continents were able to freely exchange flora and fauna like never before. The migrations are thought to have been a bit lopsided. Tropical flora and fauna did not do as well farther north but temperate flora and fauna seemed to find warmer climes more favorable. As such, South America gained disproportionately more biodiversity as a result. This pattern did not hold true for everything though. For the oaks, only one species (Quercus humboldtii) made it through. As such, the genus remains a dominant fixture of the Northern Hemisphere. Sadly, much of this diversity is at serious risk of being lost forever. Like the magnificent Quercus insignis, many of the world's oaks are on the decline. Disease, habitat loss, and countless other issues plague this genus. A 100 million year old journey is quickly being undone in less than two centuries. The hand of man is time and again proving to be a force unrivaled in the biological world.